Dr. Patrick Padrnos hails from the Midwest (Yankton, SD). He attended the University of S.D. for his undergraduate studies. He attended optometry school in Oregon at Pacific University. 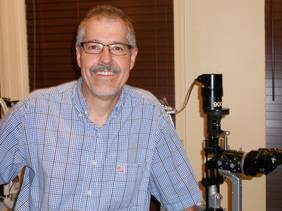 In 1985 Dr. Pat landed in Flagstaff, AZ where he has had an optometry practice ever since. Dr. Pat enjoys his profession more every year. He gets to work with his daughter, Jamie – the apple of his eye and the source of his grey hair – (but that’s another story-how much time do you have?). Now, Dr. P’s other daughter Sarah has joined the practice and will be rounding out the team – he couldn’t be happier.